When Las Vegas comes to mind we think of high rollers, casinos, flashing lights and expensive shows, wild weekends and mad adventures. The main ingredient for these things is usually money. Here are some things you can do in Las Vegas which won’t leave your wallet wounded and your credit card maxed out. This ticket is valid on the day and all day between 10am and 6pm. 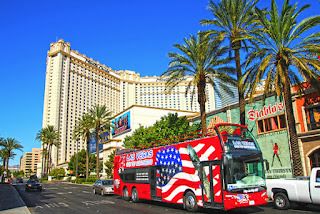 The bus will stop at 13 key points of interest in the city including the historical Downtown and the Las Vegas Strip. This will be an entertaining live guided tour for the whole family to enjoy. You can learn why Las Vegas became the ‘wedding capital’ and see all the themed restaurants and hotels. The ticket also includes many additional bonus offers when it comes to dining and shopping. Las Vegas has a lot more to offer than casinos and high class restaurants. At the fashion outlet you can buy and discover items of clothing from world class brands at a fraction of the retail price. Travel in style in the shuttle and shop in a comfortable and safe environment. Michael Turco combines his talents with Lacey Schwimmer to create spectacular dance numbers and magical illusions. Listen to Turco’s trademark storytelling as he fills an hour with amazing tricks just for you. See the wax likenesses of your favourite celebrities at the renowned Madame Tussauds in Las Vegas. have your picture taken with Lady Gaga or pose next to Elvis Presley. Be amazed by the detail that has been put into the wax figures. With wax museums in other capital cities, and this Museum is well worth a visit. These are a series of mobile phone apps where, with your cellphone as your guide, you will be able to discover and explore Las Vegas in an ultra modern way. This is appropriate for groups or any size as well as children. Enjoy a scavenger type hunt in a new and innovative way to tour the neon city. There are many many ways to experience the glorious city of Las Vegas without spending a huge amount, just make sure you research all the options, then get out there and enjoy!